Today I'd like to introduce you to a terrifically fun shop on Etsy! When I discovered this shop, I was actually hunting for something else entirely, but when I ran across Clay Monster, I immediately knew that this shop was one that I had to share with all my readers here on my blog! Clay Monster on Etsy is the brain child and creation of the husband and wife team, Rich Holt and Cat Audette Holt, who together not only run this wonderful shop but create all the whimsical and funny creatures and items inside! What do they make? 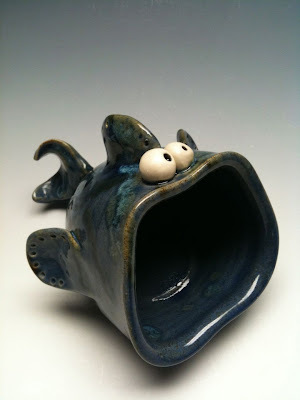 They make one of a kind whimsical monster vessels! And by vessels I mean not just the ordinary vase or bowl either. There's functional pottery, of course, from soap dishes to vases but there's also cookie jars, monster creatures and other fun and funny stuff as well! Each creature is thrown on the potters wheel and created by hand, and every single one of them is a unique one-of-a-kind creation never to be repeated again! YOU CAN CLICK ON THE PICTURE ABOVE TO VISIT CLAYMONSTER ON ETSY AND TAKE A LOOK AROUND OR, IF YOU PREFER, YOU CAN CLICK RIGHT HERE! You can also visit Cat and Rich and all their wonderful Clay Monsters on the Clay Monster Facebook Page!